Rockland, Maine, is welcoming its largest cruise ship of the season, but not everyone is on board. 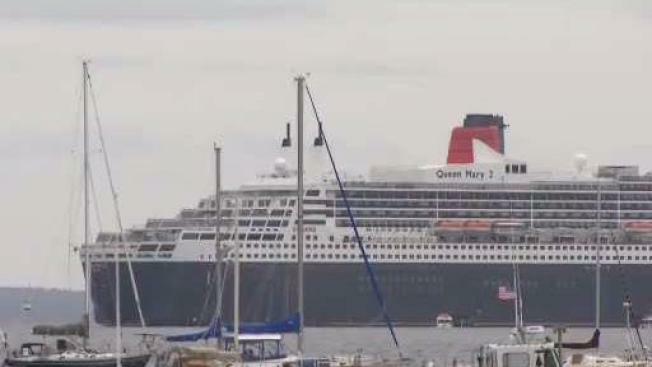 The city of Rockland, Maine, is welcoming its largest cruise ship yet: the Queen Mary II brought about 2,500 passengers to the midcoast Tuesday morning. While the short-term tourists spent some time and money exploring downtown, not everyone in Rockland is on board with the cruise ships coming. Some worry that the small city cannot accommodate the large crowds, and that the ships could bring pollution and changes to the working waterfront. As they study the cruise ship question, the city has temporarily restricted the number of large cruise ships to six per year -- with a 3,000 passenger limit. The Responsible Tourism Alliance has been asking the city council to adopt strict regulations. The group has been active on social media, spreading information about cruise ship pollution and estimated economic impacts. They argue the cost to accommodate the cruise ships is not worth the value they add to the local economy. MacLellan-Ruf said many in Rockland are worried that the harbor's infrastructure is too old and small for large crowds. She said the public landing would need millions of dollars in improvements to handle more passengers. But others, like the Tom Peaco, director of the Chamber of Commerce, say the cruise ship passengers are an important part of the tourism economy at this time of the year. "It's a great shot in the arm for a lot of folks in what tends to be a slower time of the year," said Peaco. He said cruise ship passengers touring the midcoast may decide to come back, and stay longer. "We view it as a kind of day-long commercial for the Camden-Rockland region, in hopes that people might come back in their car someday." Some Queen Mary II passengers say they are hoping to do just that. "I like it. I wouldn't mind coming back," said Daniel Katz, visiting from New Jersey. "It's very nice, calm and peaceful here," said Stephen Kennedy, visiting from England. Rockland's downtown was bustling with people visiting cafes, restaurants, shops and the Farnsworth Art Museum. "It's a great day for our downtown restaurants and merchants," said Peaco. While he understands why some people are worried about the negative impacts of cruise ships, he says there is a balance Rockland can strike that will benefit the economy without changing Rockland's character. The Harbor Management Commission is supposed to study the issue for one year.